The Old Master Paintings sales in New York this year, with Sotheby’s in January and Christie’s just this Thursday April 27, realized a total of $50,475,000 (excluding buyer’s premium), against a total pre-sale estimate of $38,530,000 to $57,590,000. The total between Sotheby’s and Christie’s was down 29.4% from early 2016 though down only 9% from the 2015 sales. Sotheby’s started off the Old Master sales of 2017 in January with a 55 lot sale during Old Master Week, raising a total of $22,630,000 (excluding buyer’s premium), within the pre-sale estimate of $19,550,000 to $27,880,000. This sale came in 50.8% lower than January of 2016, and 53% lower than January 2015, accompanying a loss of market share from 86.4% in 2015, to 64.3% in 2016 and 44.8% after these latest results. Christie’s followed several months later to have their Old Master sale during New York’s Classic Week, with a 48 lot sale raising $27,845,000 well within the pre-sale estimate of $18,980,000 to $29,710,000. After moving their New York Old Master Paintings sale from January to April in 2017, Christie’s has slowly gained back market share from 13.6% in 2015, to 35.7% in 2016, and this latest sale left them with a 55.2% market share. Top 10 Old Master Auction Results in London and New York (2000 – 2017). 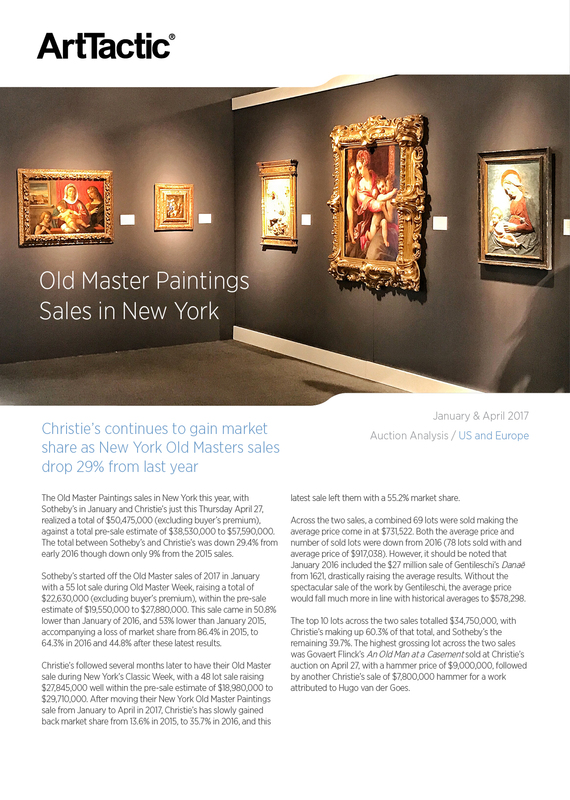 Christie’s continues to gain market share as New York Old Masters sales drop 29% from last year.